I have a new label lust **shocker;)** and it goes by the name of Dagmar. The Swedish based House of Dagmar was launched by three sisters in 2005 and has steadily grown in prestige throughout the fashion industry. The line is known for being both unconventional and sophisticated and has the artistic "downtown" feel that I look for in my favorite brands. The founding sisters define the brand as "arty chic" and are continually inspired by their late grandmother, Dagmar. She herself was a tailor and inspired their love of fashion from a young age. Many of the pieces in Dagmar are hand knitted or have hand crafted details, which pay homage to traditions from the past. 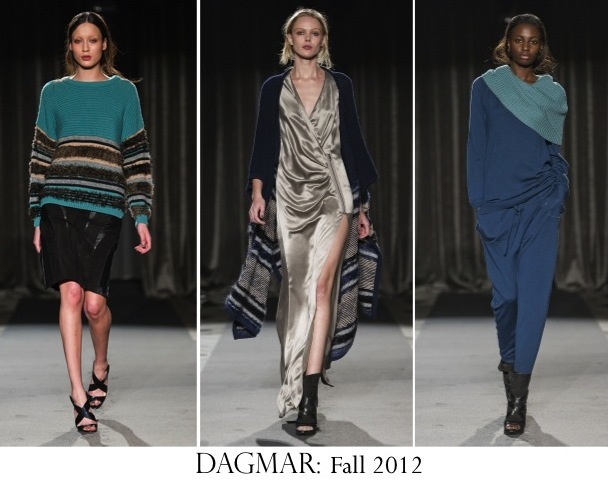 Dagmar items are edgy yet sensual, graphic yet feminine, and trendy yet classic. The line is known for its Art Deco inspiration and always has a plethora of statement pieces. Currently you can find Dagmar on Asos, but keep an eye out for its debut on Net-a-Porter soon. Win a $100 coupon code of sheinside on my blog! I love that jacket from the 5th image, it's really interesting. love the pop of red in the pre-fall collection! That top row is my fave - but those are the colors I wear all the time :) Thanks for sharing, haven't heard of the label before! OMG the gold dress with the zipper slit is AWESOME!!! The second column is my favorite, I love the pops of red! Check out my blog and follow along on bloglovin if you'd like! Love the Dragmar collection!!! Great for effortless chic looks!!! Inspiring! oh wow, looove the looks! ooh...especially love the draping and cutouts! LOVE that orange maxi. I need it in my closet now! I love their casual yet slightly edgy vibe. And the colors are perfect too! Can totally see why you're obsessed - there are some seriously amazing clothes here! Thank you for following my blog btw, I am definitely following you back! I too am obsessed, their designs are super cool. Wow, i love this clothes <3 and your blog. I am your latest follower :-).